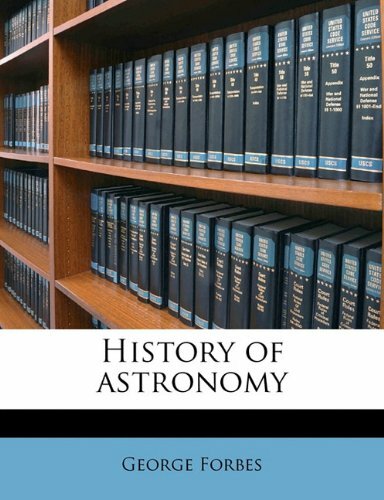 Packed with color photographs, this comprehensive reference chronicles the history of astronomy. This extraordinary book traces humans' interaction with the endless wonders of the night sky. The authors, both expert astronomers, researched 29 locations worldwide, from Beijing's ancient observatory to the observatory in Puerto Rico that searches for alien radio signals. They also interviewed 26 of the world's most esteemed astronomers, including Stephen Hawking. Through its engaging narrative and stunning full-color photography, The History of Astronomy tells the remarkable story of a discipline that continues to test the limits of imagination and exploration. This book is large enough at 10" x 12" to be considered a `coffee table' book.The book features a nice mix of scientific explanation, biographical information, and excellent pictures. The history starts with ancient astronomical structures and Polynesian navigators and continues in a progressive timeline to the 1976 Mars Viking landers and current SETI antennas.The latest Mars rovers and Phoenix lander are not covered. I highly recommend the book for light bedtime reading.As the book isn't too technical, it is suitable for younger readers.At the same time, it provides intriguing enough information to encourage me to search the web for additional details regarding some of the astronomers and topics that are presented. I was disappointed greatly with the contents of the book. Hoskin and Gingerich peddle the old Eurocentric view of astronomy. Short shrift is given to the views of scholars such as R.R. Newton and Dennis Rawlins. The presentation of material is very shallow, and the tangled web behind the advances of Kepler and others is not presented. It is like whitewash. For millennia humans have studied the skies to help them grow crops, navigate the seas, and earn favor from their gods. We still look to the stars today for answers to fundamental questions: How did the universe begin? Will it end, and if so, how? What is our place within it? John North has been examining such questions for decades. In Cosmos, he offers a sweeping historical survey of the two sciences that help define our place in the universe: astronomy and cosmology. Organizing his history chronologically, North begins by examining Paleolithic cave drawings that clearly chart the phases of the moon. He then investigates scientific practices in the early civilizations of Egypt, Greece, China, and the Americas (among others), whose inhabitants developed sophisticated methods to record the movements of the planets and stars. Trade routes and religious movements, North notes, brought these ancient styles of scientific thinking to the attention of later astronomers, whose own theories—such as Copernicus’ planetary theory—led to the Scientific Revolution. The work of master astronomers, including Ptolemy, Galileo, Kepler, and Newton, is described in detail, as are modern-day developments in astrophysics, such as the advent of radio astronomy, the brilliant innovations of Einstein, and the many recent discoveries brought about with the help of the Hubble telescope. This new edition brings North’s seminal book right up to the present day, as North takes a closer look at last year’s reclassification of Pluto as a “dwarf” planet and gives a thorough overview of current research. With more than two hundred illustrations and a comprehensive bibliography, Cosmos is the definitive history of astronomy and cosmology. It is sure to find an eager audience among historians of science and astronomers alike. 1. The scope of the work is comprehensive and covers astronomy from ancient times to the most modern techniques and challenges.You should scan the Table of Contents in the "Look Inside" feature on Amazon to get a feel for the range of topics presented. 2. It gracefully explains how, over time, contributions from cultures and individuals combined and evolved into the astronomical systems in use in each era and evolved into today's view of the universe. 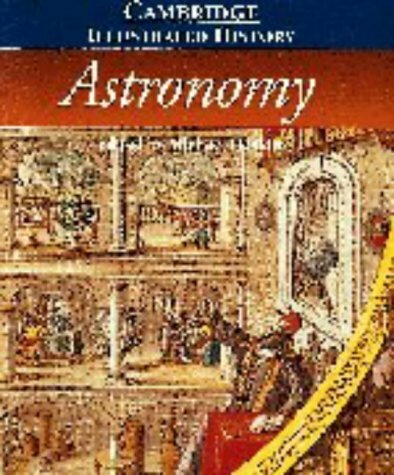 The first half of the book deals with ancient and medieval astronomy, including not only Western cultures, but also how astronomy developed and was used in China, India and the Americas.The presentation is seamless and gives the reader a good feel for how astronomical ideas and measurements were influenced by many cultures. The second half focuses on the evolution of astronomy as a science and how contributions from many individuals were refined and combined to create a coherent view of the universe. It ends with a look at the research challenges facing the modern astronomer and astrophysisist. 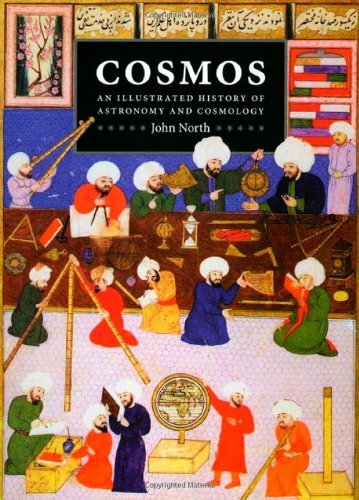 "Cosmos" is an expanded version of North's, "Norton's History of Astronomy and Cosmology", with a large amount of additional material and is much better illustrated.It is written for an educated general audience and can serve as a "read" just for fun, a textbook or a permanent reference. It took me rather a long time to get through the entire book as it inspired me to dig into other sources for more detailed material on some points.What more can you ask of a history book than to open doors? In Ptolemy's The Almagest, the earth is placed at the center of the universe and the planets move in crystal spheres against a backdrop of fixed stars. While these ideas have been swept away since the scientific revolution, Ptolemy's influence on astronomy was profound and long--we'll be dealing with the Y3K problem before Copernicus's time of influence catches up. I took the class from the Author at the U. of Washington in 1984, and have kept the handouts all these years.It was one of the best classes I ever took, and the material was always fantastic! The book takes you thru a long history of the foundations of astronomy with well documented informaton, as well as many hands-on projects you can do.You atually get to redo some ancient astronmy -- building sundials, and even an armillary sphere! This would be a wonderful book to work thru with a child interested in the sky. I love this book, but some publisher blemishes diminish it from a perfect five to a mere four. For a long time I've been looking for a book to explain how astronomical observations and calculations were made by the "ancients".I recently discovered this book and it seems to have everything I was looking for.Indeed, after only reading 2 or 3 pages I've learned a great deal; for example, what star risings and settings mean and how they were used determine the calendar.In thumbing through later pages I see promises of explaining all sorts observations and how they were made.For example, how can you accurately determine the position and motion of the sun in a star field when the sun obliterates the view of the stars near it?The historical precedents and chronology presented also help make this book a great pleasure to anticipation. However there are two deficiencies, in my opinion, that detract from the book.One is in the presentation and one is the fault of the current publisher, Oxford Press. This book needs a much better index, and, if possible, a glossary of terms.I don't read a book like this sequentially.I read a part that looks interesting, move ahead, then go back to clarify something, then move forward, then back again; a kind of iterative learning.By the time I finish I will have, literally, read it two, or three, or more times.I'm not very knowledgeable in astronomy and this book introduces many new terms that are very similar sounding, and defines them, casually, in the middle of paragraphs.Thus, it difficult to keep track.I'm sure it would interfere with the flow of the presentation, but clearly highlighted definitions and a more complete index would help. My real complaint is with Oxford Press.This new hardcover book, that I just purchased (September, 2009), is nothing more that about 250 sheets of 8.5 x 11 paper that was Xeroxed on both sides, combined and glued at the spine and placed between "hard" covers.The illustrations, which were not that great in the original, are really below par here.I don't mind a Xeroxed copy, which would be useful for personal annotation and comments, but not at this exorbitant textbook price. The original version, which I looked at a library, was properly produced with sewn signatures and pride.My copy is nothing more than a paperback and will crack and break apart long before I finish it.I've had this experience before with Oxford. I have a copy of "Astronomy" by Michael Hoskins and it is a wonderful book.But it started to fall apart and then I realized how cheaply it was produced.I realize that there is a new philosophy in the textbook trade; use it and lose it.Publishers want you to buy it, use it once or twice, and then discard it or have it fall apart.Some electronic books seem to come with licenses that expire after the semester is over.What trash.I still refer to my college texts of more than forty years ago. 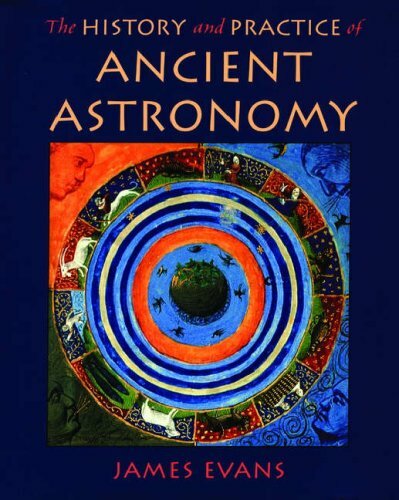 This is an extremely useful book; by far the most user-friendly guide to ancient astronomy available. Both the technical and historical aspects are generally presented with admirable clarity. My only complaint is that the early chapters on pre-Ptolemaic ideas are too cursorily treated. Unlike the thorough discussion of Ptolemy's system and the outline of Copernicus' system, this early material is presented in recipe-book form with little emphasis on ideas. Consider for example the theory of the gnomon. Much time is spent discussing gnomon plots (i.e. plots of the shadow cast by a vertical stick in the course of a day) and their practical uses. But our curiosity is suppressed: looking at a sequence of gnomon plots over the course of a year (p. 54) one naturally wonders why the curves are hyperbolas, except the equinoxes where the curve is straight. Not even the latter is explained. This is very unfortunate because it would have paid off greatly to think about these interesting and natural questions at this stage, since the answers lead naturally to several ideas developed subsequently. Let's see how. Why hyperbolas? Because the sun moves in a circle, thus generating a cone with the tip of the gnomon as vertex; drawing the gnomon plot amounts to cutting this cone with a plane, so one gets a conic section. Why straight at the equinoxes? Because then the daily orbit of the sun contains the tip of the gnomon in its interior; drawing the gnomon plot amounts to cutting this plane with a plane, so one gets a line. These simple insights are very fruitful. They immediately suggest Ptolemy's equatorial ring (p. 206), for example. And they would have helped us greatly in the construction of the sundial (pp. 133-139), a very complicated construction which Evans pulls out of a hat in pure cookbook form. If we had taken the time to think about the gnomon plot earlier we could now have approached this construction much more naturally as follows. To create a sundial means putting hour marks on our gnomon plot. To do this we should divide the sun's daily orbit into 24 equal parts and figure out how to find the corresponding points on the plot. This is easiest at the equinoxes, since the orbit and the tip of the gnomon are then coplanar, as we saw. By contrast Evans goes straight for the much more complicated cases of the solstices, and then obtains the marks for the equinoxes as a by-product. This construction would have been natural instead of artificial if one had understood the equinox construction first, just as later the solar theory (being simple but having the essential ideas) is a good introduction to the planetary theory, as Evan emphasises. In fact, if we were willing to settle for an approximate sundial we could have avoided Evans complicated construction altogether by extrapolating the hour curves from equinox line by qualitative reasoning as follows. Since the sun's position at a given hour throughout the year are all coplanar, the hour curves on the dial will be straight lines. It is also easy to see that the noon hour line will be perpendicular to the equinox line, and that the other hour lines will deviate only slightly from this in a sun-feather pattern. This would give us a sundial that would be perfect around the equinoxes and accurate surely within an hour at the solstices. After this it would be easier to appreciate the full construction at the solstices. The History and Practice of Ancient Astronomy by James Evans is a wonderful, comprehensive study.It is beautifully illustrated with original drawings of early astronomical instruments and charts. I got a copy out of the library because I needed to learn about armillary spheres and astrolabes and and couldn't find much useful information anywhere else.I found it so interesting that I bought my own copy. Upon receipt of this book, I just read it from cover to cover. It's easily one of the most interesting and illuminating astronomy books that I own. Astronomy is one of the oldest intellectual disciplines, and together with mathematics it has a distinction that its history can be traced continuously for several thousands of years. In fact, it is probably much older than mathematics, since we have indirect evidence that even the Stone Age peoples had used positions of stars in the sky for navigation, not to mention all the effort that had gone in the understandings of the sun and the moon. It is maybe somewhat surprising to the moderns that for the better part of its history astronomy had a very practical and sometimes crucial role to play in human societies. As has already been mentioned, being able to predict positions of the stars was invaluable in navigation, and the monthly and yearly positions of the moon and the sun were crucial for the planning of large and predictable agricultural projects. This very short introduction aims to recapture some of these historical developments. 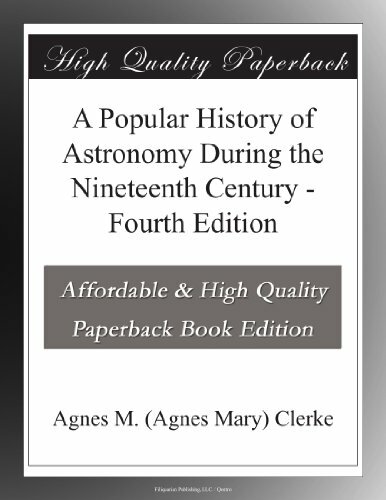 It deals with all the major highlights in the (recorded) history of astronomy up to the middle of the nineteenth century. It is a fascinating look at the way that our understanding of the humanity's place in the universe has developed. I particularly enjoyed the fact that the author did not go down the trite and misleading "religion vs. science" path when approaching this subject, and showed how for each astronomical development there have been many points of view within religious community itself. Furthermore, many (most?) religions do rely on astronomical phenomena for their religious observances, and have throughout history been major supporters of astronomical research. This is very well written and accessible book. As someone who enjoys reading about both history and science I have been practically glued to it. I highly recommend it. This "Short Introduction" was certainly informative for me. And it was what I expected. Now, I hope that there will be a sequel that picks up where this one ends, updates us readers into the twentieth and twenty-first centuries. I love this Oxford "A Very Short Introduction:..." series. I have quite a collection and have yet to find an edition I didn't enjoy reading or learn something new from. If you want an accessible introduction to a new difficult subject, this series is the place to begin from. Lucid overview of the development of astronomy as a science, from ancient times till the mid-19th century. This is an excellent short history of developments in astronomy from prehistory to the 19th century. 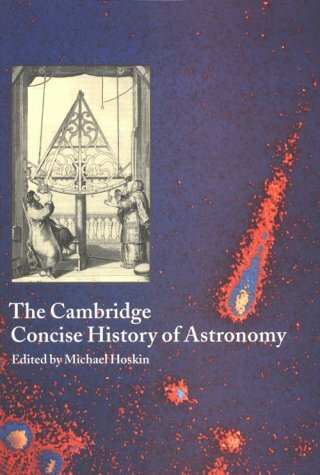 And there is perhaps no one better suited than Michael Hoskin to write it: he is the editor of the `Cambridge Illustrated History of Astronomy'; he has also been the long-standing editor of the `Journal for the History of Astronomy.' He if anyone can distill millennia of stargazing to under 125 pages. The six short chapters cover the sky in prehistory, astronomy in antiquity, astronomy in the middle ages, the Copernican revolution, astronomy in the age of Newton, and developments in stellar and nebular astronomy (looking beyond our solar system). The book also provides a number of useful illustrations. 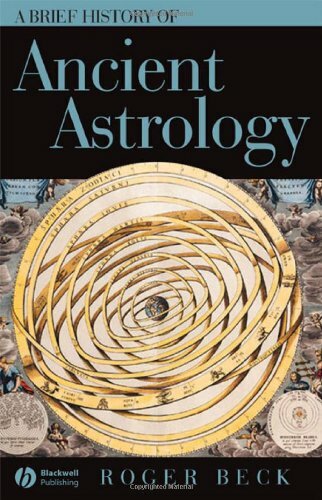 A Brief History of Ancient Astrology explores the theory and practice of astrology from Babylon to Ancient Greece and Rome and its cultural and political impact on ancient societies. Discusses the union between early astrology and astronomy, in contrast to the modern dichotomy between science and superstition. Explains the ancient understanding of the zodiac and its twelve signs, the seven planets, and the fixed circle of 'places' against which the signs and planets revolve. Demonstrates how to construct and interpret a horoscope in the ancient manner, using original ancient horoscopes and handbooks. Considers the relevance of ancient astrology today. America's first successful attempt at robotic lunar exploration, the nine Project Ranger missions culminated in close-up television images of the moon's surface. Sponsored by NASA and executed by the Jet Propulsion Lab, the project ran from 1959 to 1965. This official NASA publication, illustrated by more than 100 photographs, presents the program's complete history. In the list of NASA's spaceflight programs of the 1960s, ranked in order of familiarity to the public, there's little doubt that Project Apollo is at the top. Next is probably Project Mercury--most people have likely heard of the "capsules" in which astronauts Shepard and Glenn flew (along with four others--can you name them?). Further down the list is Gemini, the relatively obscure but very important program that bridged Mercury and Apollo. Then it gets tougher. How about unmanned programs? There's a slim chance that the names Explorer, Pioneer or Mariner may trigger a tiny flash of recognition. But there's a name on the list that almost certainly goes totally unrecognized by all but the most ardent space buff. That name is "Ranger." It's a shame, really. Ranger was one of the most technically and operationally challenging space programs ever. Marred for years by a frustrating series of failures, the program finally, in 1964, accomplished its goal of taking close-up photographs of the surface of the moon. The first six missions failed for a variety of reasons, most connected with the fact that America was then in the very early stages of learning how to fly in space. The last three--Rangers 7, 8 and 9--were spectacularly successful. These spacecraft, built and operated by the Jet Propulsion Laboratory of the California Institute of Technology, each returned thousands of stunning black-and-white images as they plunged to destruction on the moon. Eclipsed by the later Surveyor and Lunar Orbiter programs, the pioneering achievements of Ranger quickly faded into obscurity as public interest focused on the manned Apollo missions. Yet Ranger enormously--indeed, almost immeasurably--influenced the development of America's capabilities to build, test, launch and fly unmanned interplanetary spacecraft. Ranger's legacy lives on in every U.S. mission to Mars, Venus, Jupiter, Saturn and beyond. Its story deserves to be far more widely known than it is. 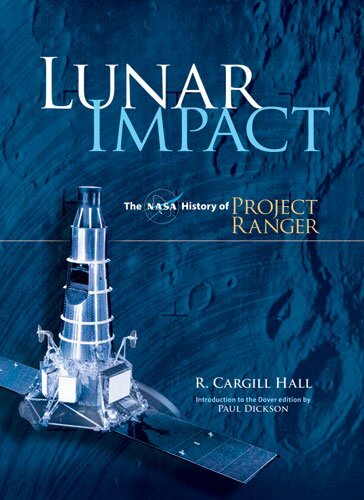 Thanks to "Lunar Impact: The NASA History of Project Ranger," you can now learn that story. Eminent space historian R. Cargill Hall's book originally appeared in 1977 as NASA SP-4210, a volume in the NASA History Series. This Dover edition is a republication of the long-out-of-print original. The book is, in a word, superb. Dr. Hall presents the story of Ranger in a very accessible, fast-moving yet comprehensive narrative. His detailed descriptions of the human, operational and technical "nuts and bolts" aspects of the program are perfectly balanced. Unlike some works produced under NASA auspices, "Lunar Impact" is not overloaded with page after seemingly endless page of minutia about organizational responsibilities, reporting chains and memo wars--subjects dear to bureaucrats' hearts. There's some of that, of course. No book about any government program can ignore these factors. But, thankfully, there's not that much. "Lunar Impact" is based largely on primary source documents and on interviews with Ranger participants. Written just a decade after the events described, while the memories of the scientists, engineers and managers were still fresh, it has a compelling immediacy matched by very few other spaceflight history books. You can't help but be enthralled, fascinated and, most important, educated by Dr. Hall's outstanding story of America's very first spacecraft designed to explore another body in the Solar System. Ranger had a well-defined beginning, middle and end, and interested readers can comprehend the entire program in a way that may not be possible for later, more complex missions. Dr. Hall's definitive work sets the standard for books of this nature. I can't recommend it too highly for all readers, and especially for space enthusiasts. They just don't get any better than this. I bought this book for my husband, a keen space exploration officionado, for his birthday and he loves it. Oh, wow! I had forgotton this project. I was in college when most of this project occurred. This project objective was to both take pictures of the lunar surface, send them back to NASA and then impact the lunar surface. These wewe unmanned, of course, but a really fascinating test. For some unknown reason the first six failed but the 7th was a success. This project occurred mainly in 1964. The exercise was to pave the way for the Apollo missions by imaging the lunar surface. This book details a really fascinating chapter in space exploration history and NASA history, too. I am so glad the author(s) wrote this book. I loved the illustrations and diagrams. There are many, many books out about Apollo but the little-known projects are the best to me. Readers, this is one of those little gems that very few will know or remember. Why did I know this? I am one of the very few women aerospace engineers who worked on the Saturn V during Apollo. We made sure that our Astronauts would be safe and Project Ranger paved the way. Project Ranger was our first baby steps to better and better satellites, deep space probes and space telescopes. Congratulstions on a book well-written. Today, the Sun is observed using different techniques that provide an almost instantaneous 3-D mapping of its structure. Of particular interest is the study of its variability characterised by the 11-year cycle. However, solar activity also varies on longer time scales, as has been attested through indirect methods as the number of sunspots and the records of cosmogenic isotopes, such as 14C and 10Be. The reconstruction of past solar activity may be also complemented by the study of historical accounts. 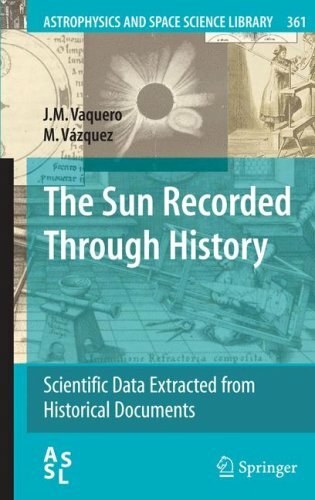 In this book we will describe how these events can be used to obtain information on parameters as solar rotation (sunspot drawings), coronal structure (aurorae and total eclipses) and radius determinations (total eclipses). "This monumental work will henceforth be the standard interpretation of ancient mathematical astronomy. It is easy to point out its many virtues: comprehensiveness and common sense are two of the most important. Neugebauer has studied profoundly every relevant text in Akkadian, Egyptian, Greek, and Latin, no matter how fragmentary; [...] With the combination of mathematical rigor and a sober sense of the true nature of the evidence, he has penetrated the astronomical and the historical significance of his material. [...] His work has been and will remain the most admired model for those working with mathematical and astronomical texts. "... a work that is a landmark, not only for the history of science, but for the history of scholarship. HAMA [History of Ancient Mathematical Astronomy] places the history of ancient Astronomy on a entirely new foundation. We shall not soon see its equal. This three volume set is precious to me.Each time I dip into these books, I find new treasures.Since Galileo, astronomy has become an observational science, but, as Neugebauer observes: "Ancient Astronomy was overwhelmingly mathematical astronomy. "He shows us how the ancients took the few and uncertain observations they had and worked out such things as the relative longitudes of Carthage and Arbela, the secne of Alexander's great victory over Darius III in 331 BC, (Ptolemy's work), the distance to the Moon (Hipparchus' work), and the length of the year. A History of Arabic Astronomy is a comprehensive survey of Arabic planetary theories from the eleventh century to the fifteenth century based on recent manuscript discoveries. 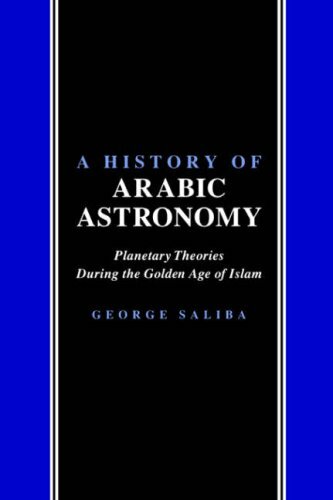 George Saliba argues that the medieval period, often called a period of decline in Islamic intellectual history, was scientifically speaking, a very productive period in which astronomical theories of the highest order were produced. Based on the most recent manuscript discoveries, this book broadly surveys developments in Arabic planetary theories from the eleventh century to the fifteenth.Taken together, the primary texts and essays assembled in this book reverse traditional beliefs about the rise and fall of Arabic science, demonstrating how the traditional "age of decline" in Arabic science was indeed a "Golden Age" as far as astronomy was concerned. Some of the techniques and mathematical theorems developed during this period were identical to those which were employed by Copernicus in developing his own non-Ptolemaic astronomy.Significantly, this volume will shed much-needed light on the conditions under which such theories were developed in medieval Islam.Itclearly demonstrates the distinction that was drawn between astronomical activities and astrological ones, and reveals, contrary to common perceptions about medieval Islam, the accommodation that was obviously reached between religion and astronomy, and the degree to which astronomical planetary theories were supported, and at times even financed, by the religious community itself.This in stark contrast to the systematic attacks leveled by the same religious community against astrology. To students of European intellectual history, the book reveals the technical relationship between the astronomy of the Arabs and that of Copernicus.Saliba's definitive work will be of particular interest to historians of Arabic science as well as to historians of medieval and Renaissance European science. I saw this book while browsing at Borders. I've been finding that I need more reference material in my home library, especially with a renewed interest in Anstronomy and a sudden curiousitywith Physics. I find the book as much entertaining as it is informative. And, its become a real pleasure to sit down with it for 30 minutes at a time and read about the human as well as the mechanical aspects of these two fascinating subjects. 'The Oxford Guide to the History of Physics and Astronomy', edited by John Heilbron, is a wonderful reference resource, but also an interesting book to read.It is organised as an encyclopedic dictionary, with over 200 entries that range in size from half a page to several pages in length.This covers history from the a little past the Renaissance to the present (with occasional references to earlier discoveries and events), including entries in other sciences such as geography and oceanography and how they relate to the issues in physics and astronomy. Entries include topics, biographies, short essays, inventions and concepts.The biographical entries are generally paired - figures such as Einstein and Newton warrant their own entries (as does Benjamin Franklin for some inexplicable reason), but sometimes the pairings don't quite seem to fit (Carl Sagan and Stephen Hawking, for example, are both popularisers of physics and astronomy, but perhaps deserve somewhat better pairings).For the concept of the pairings, inspiration seems drawn from Plutarch, whose magnum opus 'Lives' paired biographies of notable figures. The overall organisation is alphabetical, but there is also a complex hierarchy of entries as well that includes primary articles for comprehensive disciplines, principle subdivisions within the disciplines, and third level entries on specific items within the subdivisions (including biographies).There are extensive cross-references as well, in addition to supplemental reading lists. 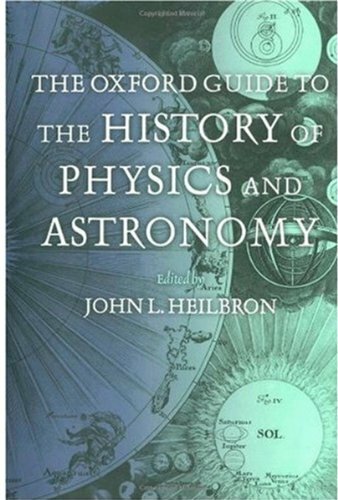 In some ways, this book is a subset of the greater work, 'The Oxford Companion to the History of Modern Science' - there is a complete listing of entries for that work included in this text, to show how this area of science fits within the greater whole (for one thing). One thing I found about this book, however,is that it is a compelling read.When I first received the book, I stopped to look up a few items, and found myself still reading through articles and following the cross-references more than an hour later.Despite being a reference book, it is an accessible and inviting text to for the reader, which is the mark of a good history text.For anyone interested in physics, astronomy, or the history of science, this is a text to be prized. I enjoyed this book immensely, because it combines two of my favorite topics, history and science, and shows how one makes the other.The book is lavishly illustrated with photographs of stone tablets, astronomical instruments, original sketches, and drawings to underpin its narrative of history of astronomy.The book takes the reader from antiquity thru Copernicus to Hobble in a narrative that is gripping as the quest for knowledge and understanding of the universe unfolds. As a scientist in microelectronics, I appreciated how people of different ages developed a concept of the universe based on their sometimes incomprehensible observational data; how that concept changed due to the ever increasing accuracy of observation; and how the need for more accurate observation drove the need for improvements in instrumentation. 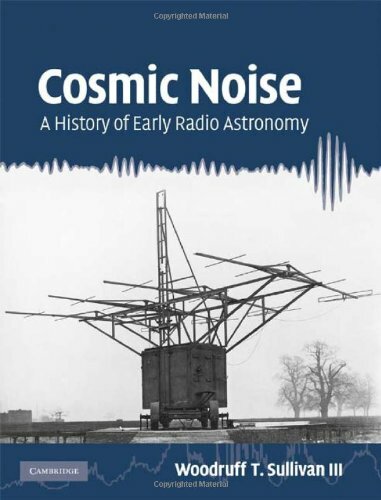 Unlike a typical astronomy (or engineering) textbook that lists facts that is perhaps a culmination of a thoughtprocess of many generations, this book tries to answer the even more important question, how did they figure that? - outlining breakthrough concepts and how and why they were arrived at but not dragging the reader down in detail. The history of astronomy is the history of people (and not that of a single genius), and how scientists and astronomers built on the results of the previous generation, sometimes tearing concepts down, but ever improving our view.There have been some very smart people in the past in astronomy and in other sciences; and it is incredible what they accomplished with what little they had.The book pays respect to these individuals, as we all should, as we all stand on the shoulders of these giants. Like other works in this series, the Cambridge 'Illustrated History of Astronomy' is both a useful reference work and a visually entertaining table-top book. Combined, those two elements make for an excellent history of the science of astronomy. The scholarship is top-notch: Michael Hoskin is the editor and a contributor, and other contributors include J.A. Bennett, Owen Gingerich, Clive Ruggles, Christopher Cullen and David Dewhirst--superb scholars all. They cover the history of astronomy from prehistory, through the invention of the telescope and the scientific revolution, to the rise of astrophysics and beyond. Astronomy in non-western cultures (China, India, Islam) is also covered, and makes a welcome addition to the traditional Euro-centric story. But the illustrations (many in color) really make the book: pictures, graphs, sidebars, frontispieces, manuscript pages, newspaper clippings, paintings, etc. enhance the written portion and make it that much more informative. 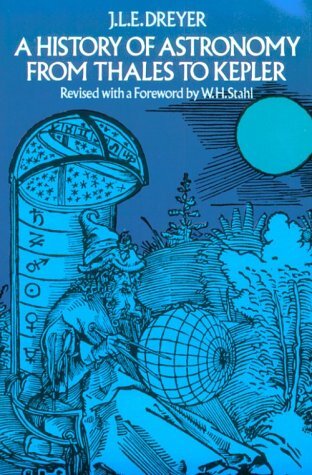 In sum, this may be the most useful and enjoyable book on the history of astronomy in print. When you see a "coffee table" book like this, you sometimes wonder about whether the writing is going to match the pictures, but with people like Michael Hoskin, Christopher Cullen and Owen Gingerich writing the text, you know that this one is going to be a winner even before you open it. Let me just say that the pictures and the desing in fantastic, and that the writing is at a level suitable for the general public without being "dumbed down". Trust me, you're going to enjoy this one! This is the single best history of astronomy I've ever encountered. Not only is the narrative interesting, the pictures--from William Herschel's journal pages describing his discovery of Uranus to full-page illuminations of the Cartesian cosmology--enhance the experience even more than one mightexpect. 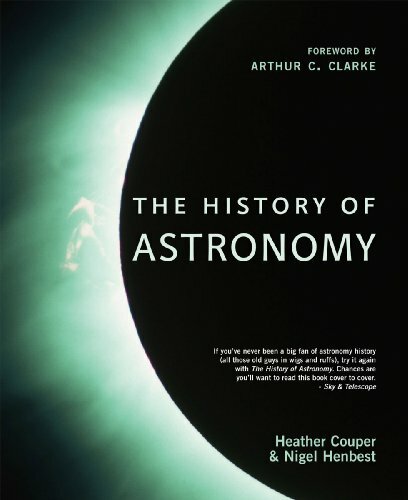 At less than ( ), this book is a must for any astronomy buff. Complete, thorough history: Near Eastern, early Greeks, homocentric theories, Ptolemaic system, medieval cosmology, Copernicus, Kepler, etc. In 1905 JLE Dreyer, an astronomer and biographer of Tycho Brahe, published this wonderful overview of the development of western astronomy from the ancient Greeks to the time of Kepler (obviously). To this day (2008) it has not been surpassed by any English-language book. As the original title (History of the Planetary Systems from Thales to Kepler) implies, Dreyer devotes most of his attention to the arrangement and the motions of the planets (this includes the sun up to the 16th century, and the earth for the last part of the book). Although it is sometimes dated, I am continually amazed at the depth as well as breadth of coverage in this highly readable work. It is not too technical, so if you've been scared off from the subject by some of the more intensely mathematical works, don't be afraid to try this. It is a fundamental work on pre-telescopic astronomy: many later authors assume you already know the big picture that Dreyer provides. Other good books of this kind (also available in cheap Dover reprints) are Thomas Heath's "Aristarchus of Samos" (on ancient Greek astronomy, covers much more than the title implies) and Anton Pannekoek's "A History of Astronomy" (much better coverage than Dreyer of pre-Greek astronomy, and goes on past the invention of the telescope virtually up to the present). Well-balanced, carefully reasoned study relates astronomy to political, social conditions of the day. Part I covers ancient astronomy, including Ptolemaic theory; Part II discusses Copernicus, Kepler, Newton, laws of celestial mechanics. Part III covers modern developments up to work of Eddington. Author saw astronomy as an adventure of the mind. Illustrated. This is more of a reference book than something you would sit down and read. The chapters on early Assyrian, Chaldean, Greek and Chinese astronomy are comprehensive and well-researched. If want an exciting read, I would recommend anything by E.C.Krupp (Echoes of the Ancient Skies) or Dava Sobel (Longitude) instead. 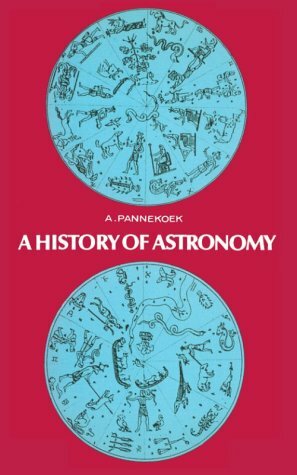 Although published in 1961, this book provides a lucid, engaging, and comprehensive review of the history and practice of astronomy from the pre-Babylonian era to the early 20th century. While lacking in depth due to the survey nature of the work, the information presented is relevant, insightful, and interesting. The flavor of the different eras when astronomy was practiced is certainly tasted as well as insights into the people who viewed the skies above. 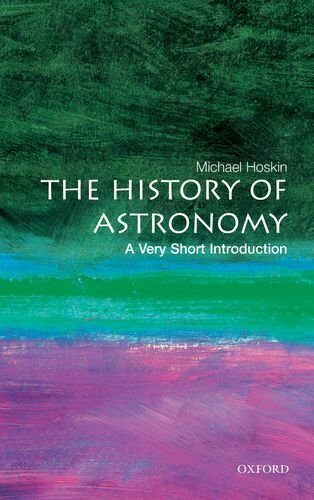 A great book for a survey of the history of astronomy. A useful project would be to append the book with the astronomical knowledge gleaned in the past century, which would show just how rapidly our knowledge of the universe has been expanding in the recent past. 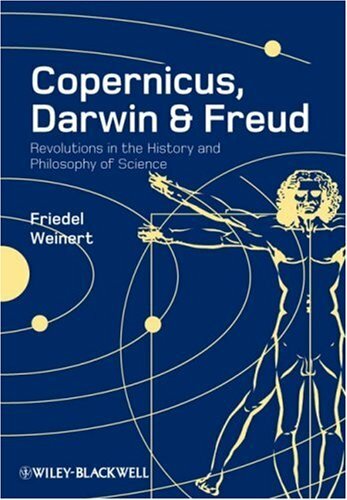 Using Copernicanism, Darwinism, and Freudianism as examples of scientific traditions, Copernicus, Darwin and Freud takes a philosophical look at these three revolutions in thought to illustrate the connections between science and philosophy. When it was published in 1543, Copernicus's new astronomy had an enormous impact on intellectual life in early modern Europe, but the reception of his new ideas differed fundamentally from one country to another. Rienk Vermij discusses how—unlike in Roman Catholic lands—discussion in the heavily Calvinist Dutch Republic was initially dominated by humanist scholars who judged Copernicus's work on its mathematical merits. Yet even in this environment, it could not escape eventual philosophical, religious, and political controversies. 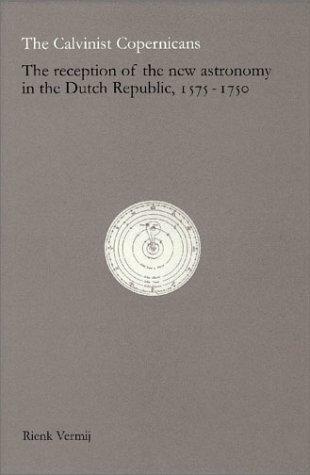 This book shows how Copernicus's astronomy changed from an alternative cosmology into an established worldview in the Dutch Republic.